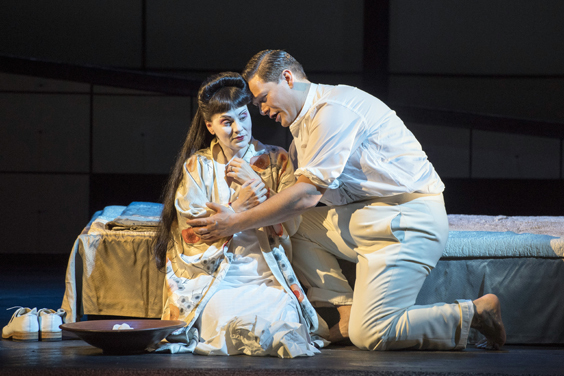 Puccini’s Madama Butterfly is one of the world’s most popular operas, and in the hands of Opera North stands a better chance than most of giving the beautiful score the credit it deserves. Their new production is high on talent, with Anne Sophie Duprels in the demanding, but highly-sought-after, role of Cio-Cio-San. Butterfly is every soprano’s coveted role, and Duprels grabs it with both hands. Her singing is superb, and her agony of mind and body as distressingly clear as her appalling treatment merits. Indeed, her treatment of one of opera’s most beautiful arias, ‘One Fine Day’, is extraordinary. My spine tingled and my tears fell, just as they should. Opera is very much a visual genre, and Cio-Cio-San’s appearance jarred with me. Her initial Japanese dress is as beautiful as it should be, but her second Act metamorphosis into a pseudo 1930 American wife, complete with short-haired bob and plain dress in a preparation for her new life with Pinkerton, is an assault on the senses. It is doubtless a brave move, but moves Cio-Cio-San into the pathetic category. Sad, heart-broken, but ever hopeful, she keeps her faith to the very end, when her strength astounds us – but pathetic, never. Merunas Vitulskis’s Lieutenant Pinkerton’s loosely immoral character is clearly shown in the narrative of his arias, and the Lithuanian dancer’s final despair as he sees the consequences of his fast-and-loose treatment of Butterfly is exceptionally good. His light tenor is also perfect for Pinkerton, and he shows his contrition well as he flees the stage, leaving us with a satisfied feeling that his own life is also in ruins. The set design of this production is not avant garde. We have the expected sliding doors of Japanese homes, the low bed and plain furniture, but nothing of the beauty, colour and elegance of Japan. 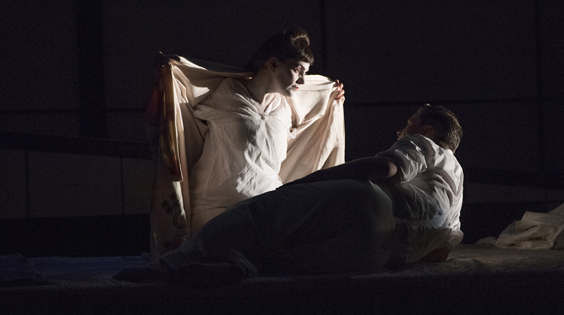 Alongside the sad change in Butterfly’s Second Act clothing, the stage set could be anywhere in the world, and we lose the sense of drama that the meeting of East and West should engender. There are, however, numerous sterling performances to applaud, including Anne Taylor’s Suzuki. Her very clever Japanese submissive movement gives us a taste of the old Japan, and her acting and singing are of the finest quality. Also of great note is Peter Savage’s role as Sharpless, the American Consul, who warns Pinkerton of the situation to no avail. His unwavering feeling that tragedy will follow is palpable. The beautiful and haunting music of ‘The Humming Chorus’ is heard as Cio-cio-San waits throughout the long night for Pinkerton to arrive, having seen his ship dock. This is an extremely long and moving scene as the light of dawn comes and Butterfly is still waiting. It is by far the most effective scene of the whole opera. Puccini’s wonderful music cannot be faulted, and Opera North’s fine orchestra pay full justice to it. The few small niggles noted in no way impaired my enjoyment of the performance, and this wonderful opera continues to thrill.